in Electronics, Photography and more…. Pasta sauce hack: How to make creamy tomato pasta the easy way. It was a lazy Sunday afternoon, and I was craving something that’s tasty, but not too difficult to make and pasta sounded like a good idea. I really love creamy Alfredo sauce, but i had no parmesan cheese on hand. I also like tomato pasta sauce, but when made fresh. I really hate the taste of store bought pasta sauces, they are way too sour and leave a weird aftertaste. But these sauces are super convenient, so I always have them in stock. So, the only stuff I had on hand was tomato (with garlic and basil) pasta sauce, heavy whipping cream and penne pasta. I cooked the pasta as per the instructions on the box, then drained the pasta. Heated some butter in the pan, added the tomato pasta sauce and while it was about to heat up added some of the heavy cream, garlic powder, dried basil leaves, and Voila!. 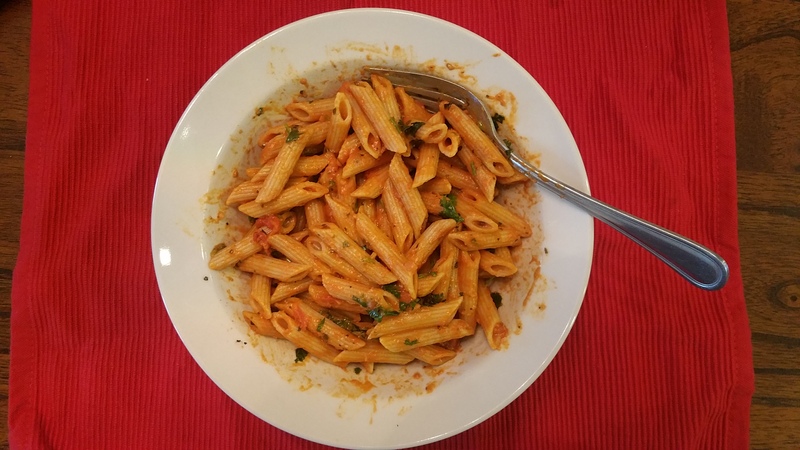 the result was this awesome creamy, rich bright reddish orange pasta sauce, that was easy to make and tasted awesome(and looked beautiful too). I added some finely chopped cilantro to the sauce too, since I really love the taste of fresh cilantro. Working on a “secret” project, and fighting feature creep!